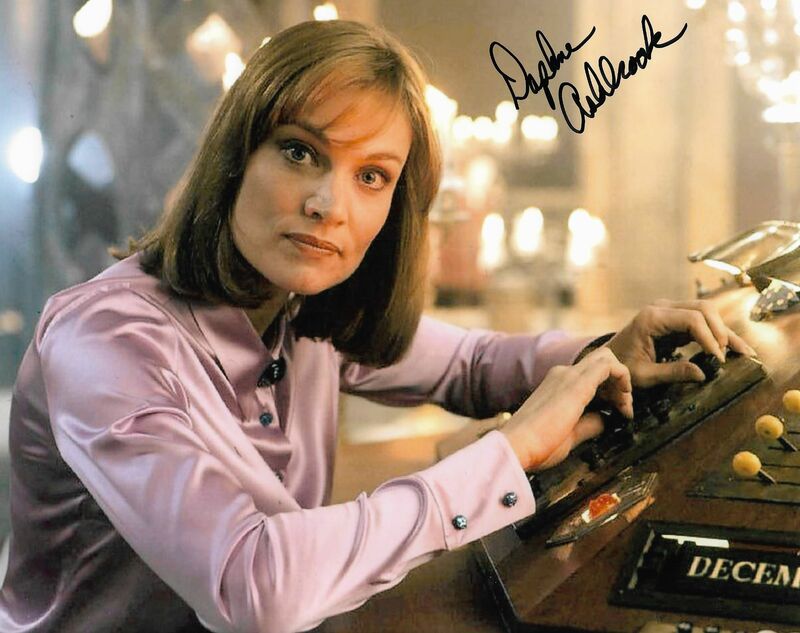 Very Rare Signed 10 x 8 Photograph of Daphne Ashbrook. Known for both her comic timing and deep emotional portrayals, she has appeared in many television and film roles including Star Trek: Deep Space Nine (as the titular character in "Melora") and the Doctor Who telemovie, in which she played the role of Doctor Grace Holloway. Her portrayal as Grace in Doctor Who caused consternation among some of that show's fans because she was the first character to romantically kiss the Doctor, setting a precedent for the more sexually charged nature of the new Doctor Who series that began in 2005. A 2004 trip to the United Kingdom was filmed for the 2005 documentary Daphne Ashbrook in the UK. This DVD documentary followed her work with Doctor Who, including her role as Perfection in the Big Finish Productions audio play The Next Life. She performed opposite Paul McGann for first time since the 1996 telemovie. In 2006, she played Charlotte Howell in the audio drama Dark Shadows: The Book of Temptation for the same company. She has been to the UK twice thus far for Doctor Who convention events. Most recently she was featured in an extensive interviews on the Doctor Who podcast Doctor Who: DWO Whocast and Doctor Who podcast Doctor Who: Podshock. Another interview on Podshock will air later in 2008/early 2009. She is notable as being one of only ten actors—and the only woman—to be credited in both the Star Trek and Doctor Who franchises. Her past TV work includes Cold Case, CSI, Crossing Jordan, JAG, Murder She Wrote, Judging Amy, the Profiler, Guardian, The O.C. and Cupid. Her recent roles include a part in David Ondaatje's 2009 motion picture "The Lodger" starring Alfred Molina, Shane West, Simon Baker and Hope Davis, and guest starring roles in The Ghost Whisperer, with Jennifer Love Hewitt, and Without a Trace with Anthony LaPaglia and Steven Weber.